If you are looking for information on the The Gutter Genie franchise business opportunity, The Gutter Genie franchises or The Gutter Genie franchising, then you have come to the right place. Our franchising system is built on the premise that the Company can be successful only if our franchisees are successful first. We believe in a partnering relationship with our owner/ operators, suppliers and employees. Success for The Gutter Genie Company flows from the success of its business partners. First, water flows off of the roof. Then Triple Flow Reducers slow the speed of the water down. Next, the water bonds to the aluminum surface. (This is referred to as Molecular attraction of surface tension. Think of it as a magnet attached to the steel. The harder it rains the stronger the bond of the water to the aluminum. The harder the rain the better it will work. It can handle 21" of rain per hour.) Finally, leaves, needles and such cannot the turn and fly off the roof and cascade to the ground. High Back Gutter Trought that better protects fascia board and prevents water from getting to the wood. Our gutters are 5" seamless gutters. The only SEVEN POINT mounting system on the market today. Our system is guaranteed never to pull away from the home. Our system is made with .032 aluminum, not .019 like most gutter companies. Our system has three reducers built into the hood. We call them "Triple Flow Reducers". They are like speed bumps on the road to help slow the flow of water down. Seamless - Every straight run is continuous. Manufactured on-site at the time of installation. No possibility of leaks at the seams - which causes staining and other possible damage to the structure. Aluminum - Will not rust as does steel. Aluminum eliminates material breakdown and rust stains on the structure. Heavy Duty - .032' aluminum prevents warping and distortions caused by ice and snow. Colors - Popular colors are pre-painted with a heavy baked on enamel finish. This is so durable that The Gutter Genie's manufacturer warranties it for 20 years against chipping, peeling or blistering. DrainGuard™ - The DrainGuard™ component is an add on that will allow one to be at ground level and check the performance of the Gutter Genie System. It is the only maintenance that owners will ever do on their system. 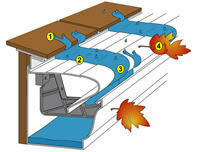 Simply pull the cover, empty any small particles that may have got into the gutters, and place back in the box. It is that simple. Lifetime transferable no clog guarantee. Our selection of prospective candidates is based on an assessment of overall business experience and personal qualifications. We look for individuals with good "common business sense", a demonstrated ability to effectively lead and develop people, and a history of previous success in business and life endeavors. A home improvement background is not necessary. We franchise only to individuals, not to corporations, partnerships, or passive investors. The Gutter Genie is currently seeking highly qualified individuals to join the The Gutter Genie family as new franchisees in major and small cities throughout the U.S.